Lion Kathy and ID Robert meet Lions at the ID Booth at USA/Canada Forum. 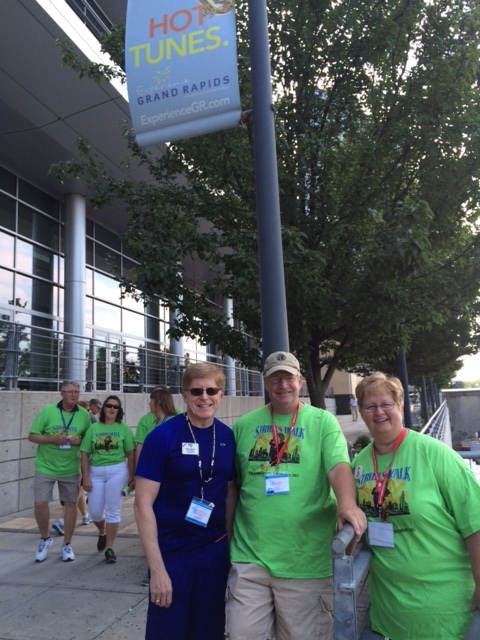 Last weekend, Kathy and I attended the 39th USA/Canada Leadership Forum held in Grand Rapids, Michigan. 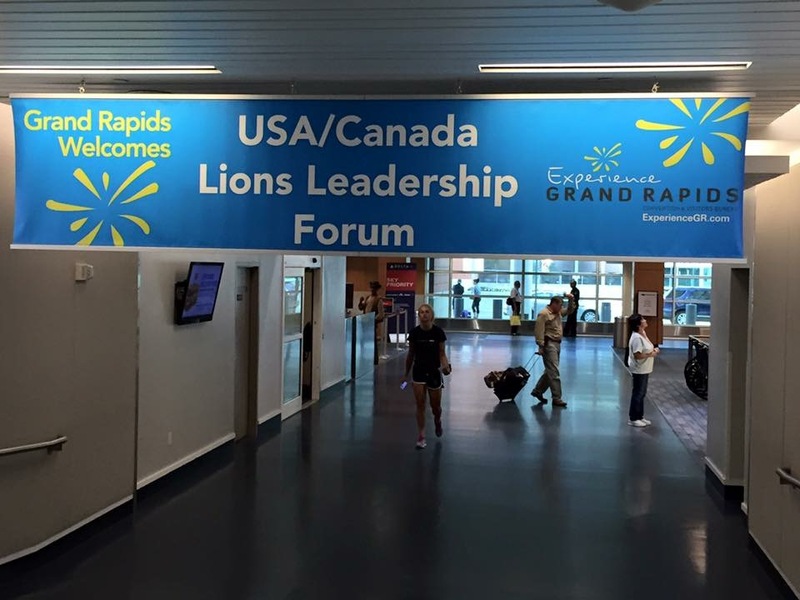 Nearly 2,000 Lions and guests participated in the “Grand Forum” held at the Convention Center and adjacent hotels. The site that welcomed us when we left the plane in Grand Rapids. 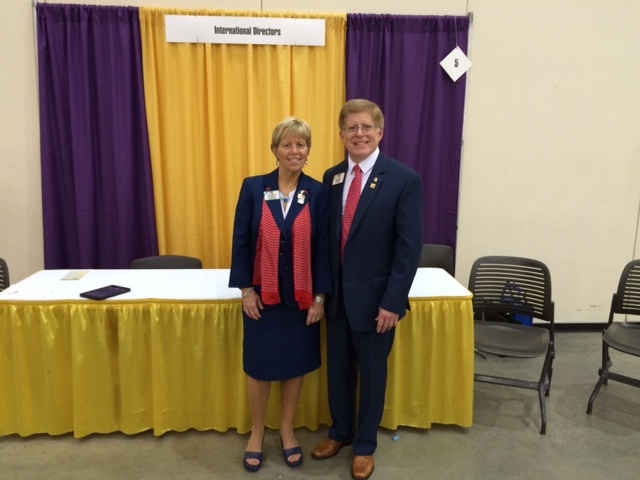 Have you wondered, “what goes on” at these conventions and forums? 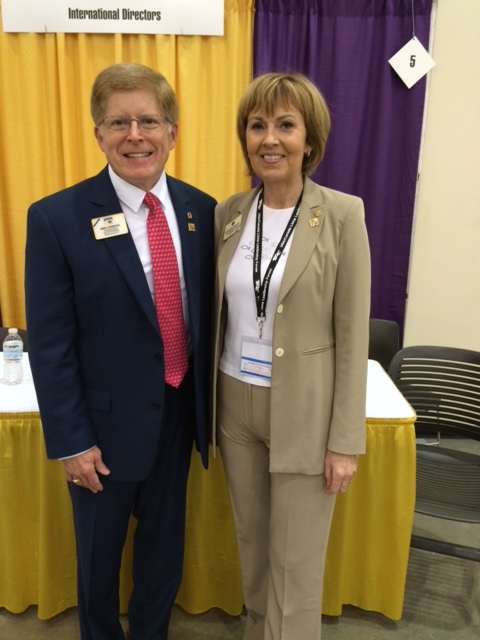 Actually, Kathy and I spend most of our time talking to Lions, sitting in on programs, presenting programs, and doing our best to represent the association. 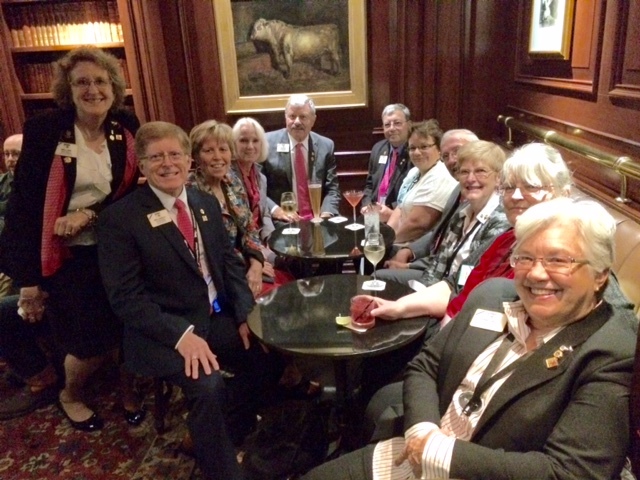 While you might expect that there is a lot of socializing (even though the USA/Canada Forum refrains from serving alcohol at any official function), I can tell you that the Lions who attended the Grand Forum were actively engaged in attending workshops and programs to help them become more effective leaders in their clubs and districts. In addition, because the forum is for Lions in the United States and Canada, there was a strong focus on strengthening the international organization, as well. We so enjoyed meeting Lions from around North America. Every meal created new opportunities for making friends. No one gets a free ride at the forum. Everyone—including the international directors and officers—pays for registration and lodging, so we all enjoy the same food and facilities. 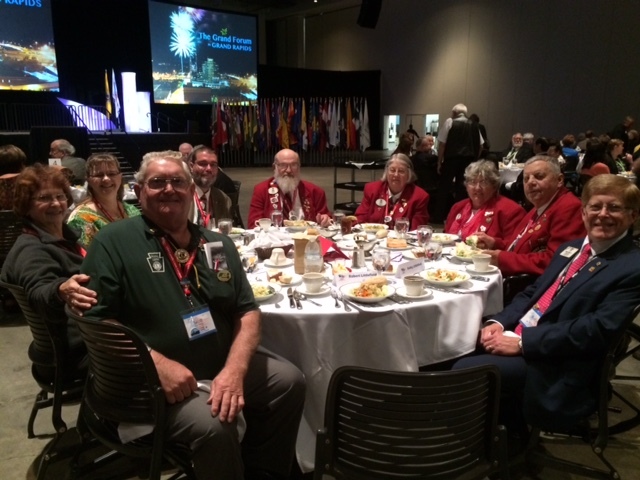 In fact, at the Forum, the international directors and past international officers serve as table hosts. This enables us to meet 10 new Lions from around the continent at every meal. This year, the Lions University—a special program to encourage Lions to participate in leadership training courses—was in full swing with over 175 earning “bachelors,” and over 60 earning “masters” certificates in leadership training. While Lions University does not have the academic accreditation as an educational institution, the Lions who took the 10 training courses and attended the forum were very proud to be recognized as completing the club training “bachelors” at the “graduation ceremony” where they received their Lions diploma and had their photo taken with Lions President Dr. Yamada. 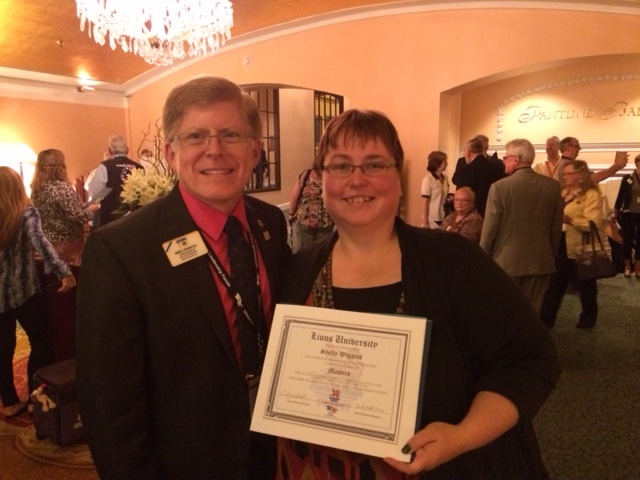 ID Robert and Lion Shelly Wiggins from Filmore, Saskatchewan celebrate her accomplishment–a “masters” in district Lions leadership. Those attending two forums and completing the 10 bachelors courses and additional masters courses in district leadership training were also recognized with a certificate and photo opportunity. I’ve seen a lot of students receive their diplomas over my years in higher education; but no matter what the context, the joy on the faces of those who have earned recognitions for gaining knowledge and advancing their leadership skills is something I never grow tired of seeing. Those who developed the idea and coordinated the courses for Lions University can be very pleased with the outcome. Thank you Past Council Chair Mark Miller, Past International Director Brian Sheehan, and PDG Wendy Cain, PID Bud Wahl, and PID Terry Graham for your leadership. ID Robert with Council Chair Kathy Jensen and husband PDG David at the USA/Canada Forum Stride Walk. Another highlight was the Stride Walk for Diabetes. When we attend conventions and forums, there are often service projects included so that Lions can practice what they preach. This year, hundreds of Lions made a donation and walked to support diabetes awareness and prevention. The route was along the Grand River and it was great to get out and enjoy the beautiful weather. 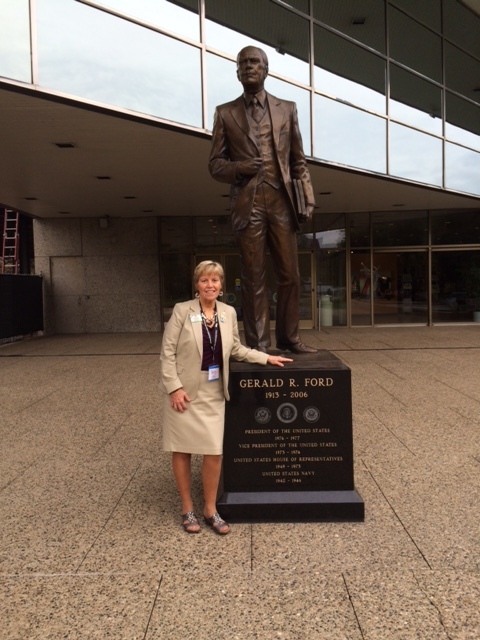 Grand Rapids is Gerald Ford country, so it is a must to visit the Presidential Library and Museum. This site also includes the burial grounds of both President Gerald and Mrs. Betty Ford. I visited the gravesite and saw the Japanese tree presented by the Japanese government since Gerald Ford was the first American president to visit that country. 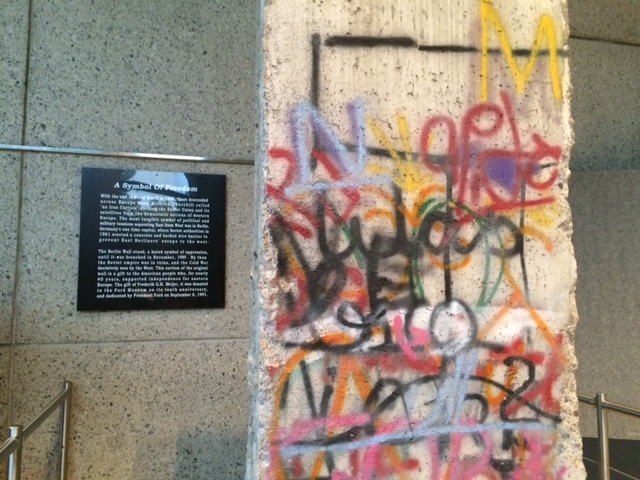 Among the memorabilia that impressed me the most was a large section of the Berlin Wall, first breached in 1989. The remnant was given to the American people as a gift for supporting independence of Eastern Europe from Soviet dominance and later donated to the Gerald Ford Museum on its 10th anniversary by Frederik Meijer. 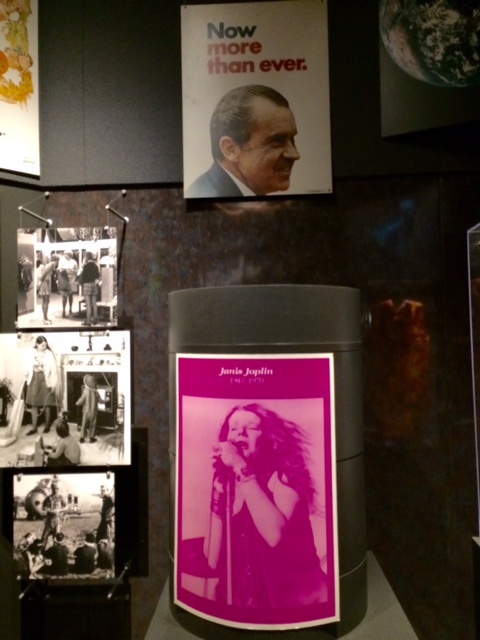 The Ford Museum contains a great deal of personal memorabilia and family treasures in addition to a wealth of political artifacts. 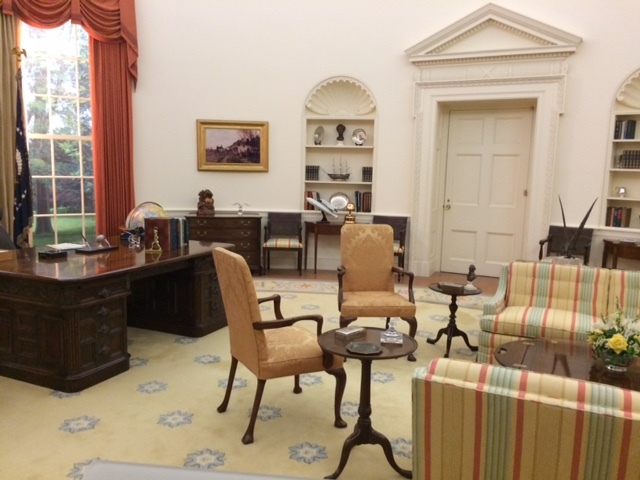 I enjoyed the exact replicas of the Oval Office and the Cabinet Room during Ford’s tenure. His term was so historical, since he was never elected president and his pardon of Richard Nixon cost him much support. 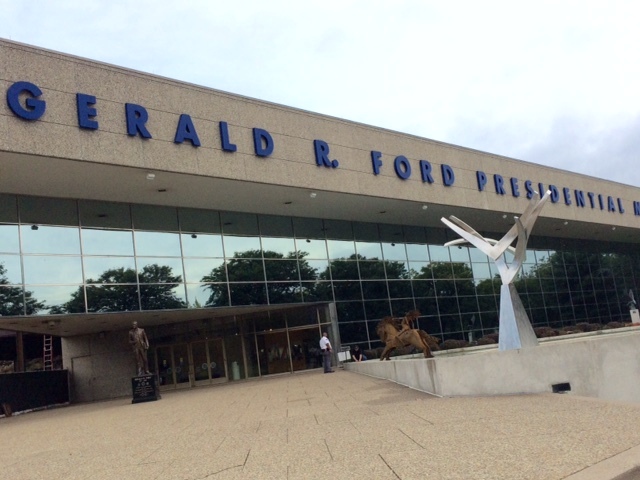 The museum contains the Bible and hand written notes used by Ford when he took the Oath of Office. In addition, his athleticism was apparent from the football souvenirs and photo displays. 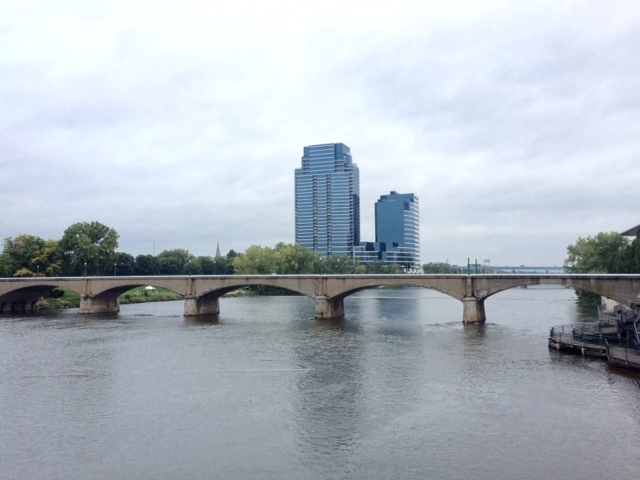 Walking back to the convention center, across the bridge spanning the Grand River, I took photos of the outdoor sculptures dedicated to the city from the labor unions that no longer hold the same significance in our country as they once did. My afternoon session proved to be a much different, more personal educational experience, in contrast to the museum. Three women whose spouses hold the top executive positions in Lions Clubs International spoke about the financial grants program of the Lions Clubs International Foundation and the life-changing work that goes on globally. First, Lion Diane Corlew shared information about her recent trip to the island of Vanuatu. Hit very hard in March by Cyclone Pam, the Lions Foundation built a new kindergarten school and the Corlews were there for the dedication this past summer. With no infrastructure in place, the Lions of New Zealand brought over to this impoverished archipelago vital materials: lumber, saws, and school supplies. The villagers were taught how to use the tools and then assisted in putting up a sturdy structure that Diane explained as being comparable to a storage shed. To the local people, this building was a treasure that represented much needed education space for their youngest learners. The kindergarten dedication ceremony included native song, dance, the slaughter of a pig, and a “ribbon-cutting” of sorts with a machete and bamboo! The second speaker, Lion Joni Preston, recounted her visit to India where a grant from LCIF resulted in the completion of a community center in an extremely remote location where the Lions of India will provide vision screenings and dental services. Despite its location, the facility was state-of-the-art in terms of the technology and equipment. Finally, Lion Dr. Toshiko Yamada briefly presented information of a medical mission that the Lions of Japan provided to the Philippines in both 2014 and 2015. Over 2000 patients were given vital medical care following an earthquake and a super typhoon. Stories like these illustrate the humanitarian works of this organization. Finally, the North American international directors (14 from the US/1 from Canada) constitute the forum’s board of directors and we met to recommend the site for the 2019 forum. Our vote went to Spokane, Washington. But in 2016, the forum goes to Omaha, Nebraska; a close drive from Fargo-Moorhead. While in Grand Rapids, it was a pleasure to see Past International Director Gudrun Yngvadottir and Past International Director Yul Choi. These great Lions are candidates for executive positions in LCI and after being screened by an international committee have been endorsed by the executive officers. ID Robert and 2nd VP Candidate Gudrun Yngvadottir from Iceland. 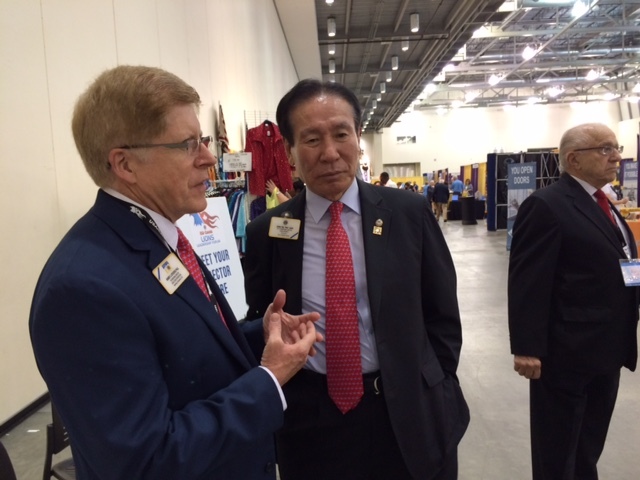 ID Robert and 3rd VP Candidate Yul Choi from South Korea. It also was great to be together with the other second year directors. When we get together, the energy level in the room increases tremendously. We are so fortunate to be part of such a wonderful group of directors. (L to R): ID Karla Harris, ID Robert and Lion Kathy Littlefield, Lion Mary and ID Jack Epperson, ID Ed and Lion Elaine Farrington, Lion Vern and ID Linda Tincher, Lion Sunny Shove, and ID Kembra Smith. Not pictured: Lion Clarence Harris, ID Don Shove, and Lion Bill Lowe. When the forum ended, we were asked if we were ready to be leaders in the second century of service. 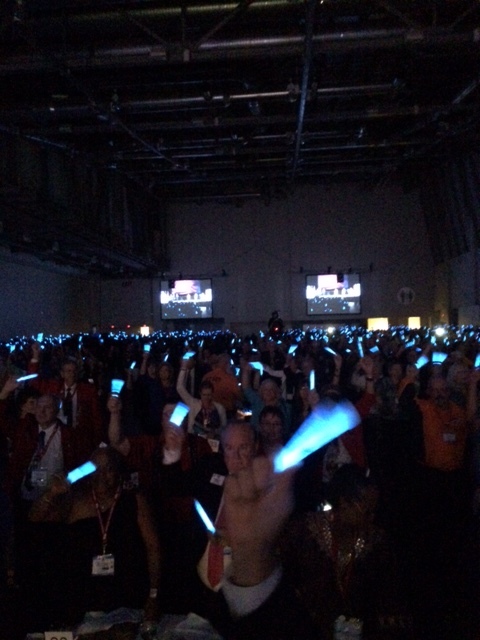 Each of us was given a glow stick and at the appropriate moment, we activated the stick and stood in solidarity; committing to service and helping our fellow human beings with dignity, harmony, and humanity. 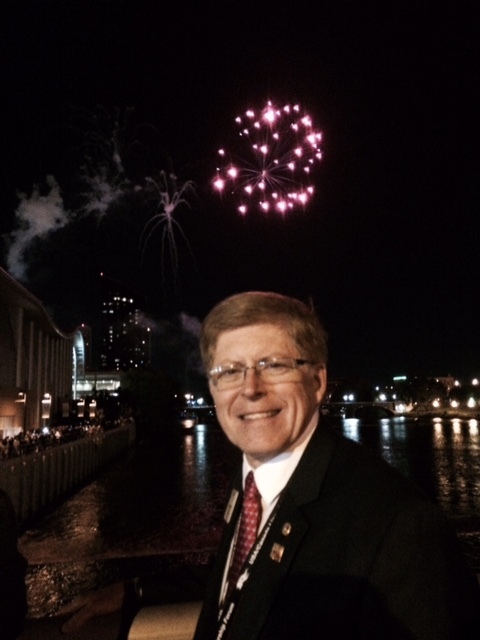 It was a moment to be remembered; followed by a spectacular fireworks display over the Grand River. Being a Lion is about relationships. When we come together at meetings, conventions, and forums, we are able to recharge our batteries and remember why we give of our time and resources. We are proud to be Lions and grateful to serve on the board of directors.